Note The TS 1500, was a stop-gap between the TS 1000 and the forthcoming American version of the Spectrum, the TS 2000. It was a ZX81 with an internally-housed 16K RAM expansion module, in a black and silver Spectrum-style box with the familiar "dead flesh" rubber keyboard. 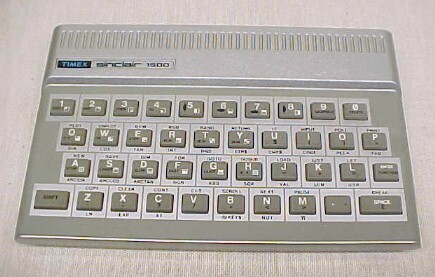 The updating of the ZX81 design was an attempt to counter the two biggest drawbacks of the TS 1000, namely the touch-sensitive keyboard and the minuscule 1K of memory. The machine failed dismally: no matter how much it was dressed up, it was still a ZX81, with most of that machine's limitations still intact.